Glenn Irwin will return to the North West 200 in 2018 to defend his Superbike crown on the PBM Be Wiser Ducati. North West 200 Superbike winner Glenn Irwin will return to the Triangle meeting to defend his crown in 2018 on the PBM Be Wiser Ducati. The announcement comes as the dates for the international road race next year were confirmed, with the main race day on Saturday, May 19. Carrick rider Glenn Irwin celebrates his victory in the feature Superbike race at the North West 200 in May. Opening practice will be held on Tuesday, May 15, with final qualifying and the evening race schedule taking place on Thursday, May 17. Irwin, who has signed with Paul Bird Motorsport for a third term to contest the MCE British Superbike Championship alongside Shane ‘Shakey’ Byrne next season, stole the limelight at the North West in May. The 27-year-old and course specialist Alastair Seeley locked horns in a pulsating blue riband Superbike finale, with Irwin narrowly coming out on top on the last lap on the run along the famous Coast Road. His wild celebrations in front of the packed grandstands at the finish underpinned exactly how much the coveted victory meant to him and four months on, Irwin is still waxing lyrical over his memorable triumph on the Panigale against fellow Carrickfergus rider Seeley. “That last lap was like a football match with the whole crowd getting involved,” said Irwin, who won the race as a Superbike rookie on the roads. “It has a special buzz for me because it is where I watched racing when I was a kid. After last year I sort of feel that I am now the person that I used to watch and that is really cool. “I am as hungry as ever to win at the North West and I know how much the team want to win again too. I thrive on support and I know how much I get from the fans at home. “I grew up in Northern Ireland and for us winning the North West is like winning a world championship,” he added. Irwin sustained serious arm and shoulder injuries in a crash during practice at Knockhill in Scotland in June, wiping out his hopes of making it into the Showdown top six. He began the season strongly, finishing on the podium in third place at Donington Park and claiming a runner-up finish at Oulton Park prior to the North West. At that point of the championship, Irwin was holding fifth place, only four points behind Aussie Josh Brookes. However, his fateful accident at Knockhill caused him to miss the Scottish round of the series plus the following round at Snetterton. 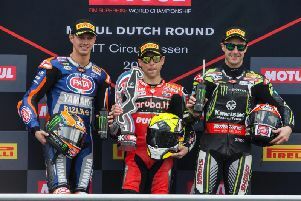 It was a hefty setback for the Ulster rider, but Irwin has battled back strongly and his fortitude was rewarded with a maiden win at Silverstone on the Italian machine. With two rounds of the Showdown to go, he is now aiming to try and take points off team-mate Byrne’s rivals to boost the team’s prospects of retaining the BSB crown. Irwin, meanwhile, will also return to the Macau Grand Prix in November on the PBM Ducati, where he was right in contention for the rostrum until an issue caused him to drop back on the final lap. NW200 Event Director Mervyn Whyte said Irwin’s breathless victory earlier this year captured the imagination of the fans. “Paul Bird is a good friend of the North West 200 and it is great news that he will be bringing Glenn back to Portrush in 2018,” said Whyte. “Glenn put in an amazing performance against the rest of the world’s finest road racers this year that really captured the imagination of local race fans.